OakLeaf Systems: LINQ to SQL Has No "Out-of-the-Box Multi-Tier Story!" LINQ to SQL Has No "Out-of-the-Box Multi-Tier Story!" Support for other databases with or without a public provider model. LINQ to SQL in compact framework. Dinesh says the missing features are ranked by "frequency/strength of the feedback and consistency with what LINQ to SQL was designed for." In my view, LINQ to SQL was never intended to support databases other than SQL Server (including Compact Edition); its expression trees are connected at the hip to Transact-SQL. This makes lack of an "Out-of-the-box multi-tier story" my number one missing feature of LINQ to SQL's v1 release. Request with a single message from the UI tier a set of related business objects for editing from a Windows Communication Foundation (WCF) service client that uses HTTP[S] or TCP-IP as the transport. Supply the business objects in a single message from a business services tier (BSL) that in turn connects to a LINQ to SQL persistence layer (PL, a.k.a. Data Access Layer or DAL). The BSL provides authentication and authorization services; WCF handles digital signing, encryption, and reliable messaging operations. Add, edit, and/or remove one or more root and/or related business objects in the UI, which is most commonly an ASP.NET Web page. Send all modified root and related business objects to the BSL in as few messages as possible, validate the changes in the BSL, update the local business objects and persist the updated objects in the PL, which reports concurrency conflicts to the BSL (and UI, if necessary) for resolution. In some questions, the BSL and DAL/PL are combined in a single layer. If you replace the term business objects with DataTables from a DataSet, the preceding scenario is in common use today with .NET 2.0 Web services. .NET 3.0's WCF simplifies creating and managing services that use HTTP and TCP-IP transports for Internet services and intranet remoting. As noted in my LINQ to SQL and Entity Framework XML Serialization Issues with WCF - Part 1 post of October 9, 2007, the DataContractSerializer serializes EntitySets by default and EntityRefs with a relatively simple patch. The usage pattern you are describing is not supported by the feature set currently available. The only scenario with 'disconnected' objects supported so far requires you to re-attach your objects and play-back the changes against them. This is intended for a multi-tier scenario where you are responsible for serializing the object's data to the client tier or browser and back again along with change information. More DLINQ features in this area are still to come. The scenario you are describing sounds like it would be better served as a two-tier model using normal attached objects databound to UI. Re-attaching is "intended for a multi-tier scenario", but Zoinky's typical multi-tier scenario isn't supported. Now there's no support for multi-tier scenarios. Playing back changes implies sending an individual message for each change, which results in an CRUDy (chatty) service, which is an anti-pattern. More LINQ to SQL "features in this area" didn't come, as noted in the next topic. If your feature doesn't support three or more tiers, suggesting that two-tier would be better won't suffice. It's obvious that Zoinky and others requesting a solution to three-tier issues would use two tiers if it suited their requirements. The reconnecting API's you have available to you at this time do not support the scenario you guys are discussing. There is more work coming that makes 3-tier scenario's easier. The re-attach and playback API's are included because they are the bare minimum required to make any reconnecting work at all, however cumbersome it may seem at this time. There is an upcoming feature that automatically databinds LINQ to SQL objects directly to webforms that use these API's to communicate changes back into the DataContext. There is also a technology in the works that automatically serializes LINQ to SQL objects to other tiers, change tracks and data binds the objects for you on that tier and serializes the objects back, solving the cyclic reference serialization problem and the indescribable schema problem for objects with change sets; which seems to match what many of you are describing. 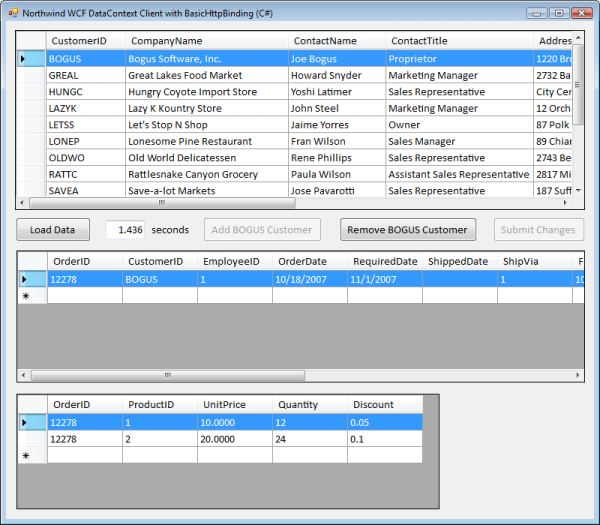 The "upcoming feature that automatically databinds LINQ to SQL objects directly to webforms that use these API's to communicate changes back into the DataContext" is ASP.NET 3.5's LinqDataSource component, which must connect to a local DataContext and dictates client/server (two-tier) architecture. I haven't seen a "playback API." The above answer is the only LINQ-related original document returned by a Google search on '"playback API" LINQ -MIDI'. We're still waiting for the "technology in the works that automatically serializes LINQ to SQL objects to other tiers," which turned out to be the phantom "mini connectionless DataContext" described in my Changes Coming to LINQ to SQL post of May 15, 2007. Needless to say, no sample has been forthcoming as of mid-October. Considering the Microsoft Developer Division's emphasis on tiered data-access architectures, initially with Web services and now with WCF, "no out-of-the-box multi-tier support" by what promised to be the most widely used LINQ implementation boggles the imagination. The "Mike Taulty Implements an Unbound DataContext in a WCF Client" topic of my LINQ and Entity Framework Posts for 10/5/2007+ post points to an article that describes how to write your own connectionless DataContext class and related code to support disconnected addition, modification, and deletion of a root object without child objects. 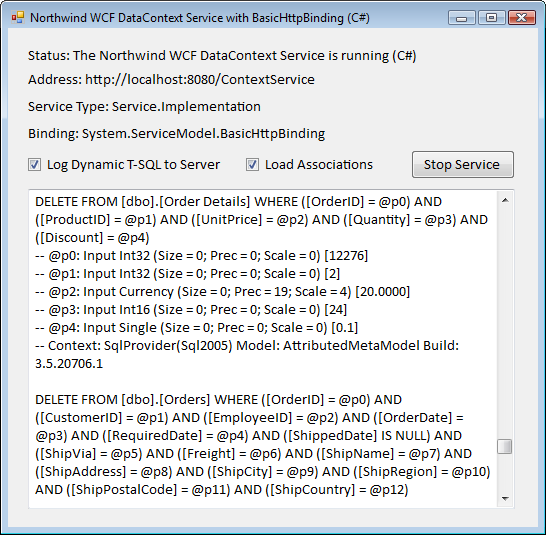 Mike's ClientSideContext class wraps a standard DataContext that has an empty connection string and uses the DataContext.GetTable() method to deliver Table<TEntity> objects without sending T-SQL queries to a non-existent persistence store. The client and server apps share a common NorthwindDataContext class (called DataTypes) generated by SqlMetal.exe. Note: The client's DataContext class copy includes persistence-related [Table ...] and [Column ...] attributes, as well as connection string information that could be removed to provide persistence ignorance. The time shown in the preceding capture is that for the client to send a SOAP response message (GetUSCustomers.xml, 177 KB) for the 14 US Customer objects (including BOGUS), with include their associated Order and Order_Detail object instances. The corresponding SOAP message from the WCF Service Trace Viewer is 3,242 bytes; click the link to view the DeleteBogus.xml trace in IE 6/7. Notice that the <before ...> node includes a serialized <a:Orders> node and the <after ...> node doesn't. You must Insert() an object before you can Remove() it. In this case the original and current values are swapped so that the before node has the original values for Order and Order_Detail EntitySets and it wasn't necessary to execute the code to add them. Roger, its not possible for GetOriginalEntityState to return copies of entities with EntityRef's and EntitySet's set. These associations are normally bi-directional, so only one entity instance can ever refer to another without duplicating the entire graph. The purpose of GetOriginalEntityState is to give back a copy of the entity with only the data fields set. Note: The preceding is a modification of Rick Strahl's approach in his Complex Detached Entities in LINQ to SQL - more Nightmares post of October 1, 2007. The SOAP request message to update the BOGUS Customer with a minor edit is 5,043 bytes in the WCF Service Trace Viewer; click the link to view the UpdateBogus.xml trace, which has only a change to the <ContactName> element value, in IE 6/7. Notice that both the <after ...> and <before ...> nodes include serialized <a:Orders> nodes. (Code adds the <a:Orders> nodes to the <before ...> node immediately prior to sending the message.) The current and original values are required for comparison when returning the entire Customer object to the service for updates. As is the case with two-tier (client/server) implementations, only object updates in DataGridViews work as expected, but edits to EntityRef members don't mark the root object dirty (reported as bug ID 305828, Change to LINQ to SQL EntitySet Member Doesn't Mark Root Object Dirty.) You also must write code to handle adding and removing EntityRef members, as well as a hack to add the root object to the lists for updates. Updated 10/19/2007 1300 PST: Clarified, added code and provided an additional XML document link to the preceding section. For this initial post, I've implemented Mike's proxy.InsertCustomers(ctx.GetInserted<Customer>()), proxy.DeleteCustomers(deleted.Current, deleted.Originals) and proxy.UpdateCustomers(modified.Current, modified.Originals) methods for one or more Customer objects with two levels of sub-objects. This demonstrates that there is a multi-tier story for LINQ to SQL but it's unlikely to win a Pulitzer prize. In fact, it's a downright discouraging story. 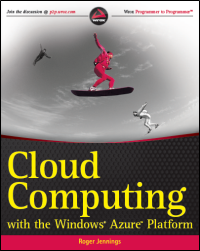 He also compares the problem of managing optimistic concurrency with the Entity Framework and LINQ to SQL in his September 19, 2007 Disconnected LINQ to Entities post. Hopefully, Mike will soon try a similar hack to create a "maxi connectionless ObjectContext." Updated 10/23/2007 0930 PST: Added and updated content to this section. A lot of emphasis on this topic has been put in the C UD of CRUD ("...points to an article that describes how to write your own connectionless DataContext class and related code to support disconnected addition, modification, and deletion of a root object without child objects. "), but not the R.
IMO, the data access layer should contain just the CRUD methods, and should be seperate from the persistence layer. The best way to achive this is to serialize the linq query before sendint it up the wire... unless of course this functionality already exists or is easy to implement (I am not talking about the dynamic linq sample here, because there is no compile time checking, and I might as well send the SQL directly) and I have forgotten to rtfm.